Owner of Kafe Herb Spice, Diana Koh says she is the walking MSG (monosodium glutamate) detector! As an importer and distributor of frozen seafood, Koh started Kafe Herb Spice two years ago after suffering from Irritable Bowel Syndrome (IBS). “I traced my IBS to food allergies. Now I can only consume dishes that are gluten-free, low in salt, without preservatives, artificial flavourings or MSG,” she said. Some of her customers who purchase imported frozen seafood from her shop have similar health problems and special dietary concerns. Many shared their experiences and healthy cooking tips with her . In return she taught them how to prepare the unfamiliar fishes and seafood. Soon they asked to her to stock ready-to-cook offerings that can be conveniently taken away. This service soon evolved into the present café. Although the outlet is rather sparse in its décor, the casual setting is comfortable enough for its weekday office and weekend family crowd. Bearing in mind the many constraints the chef has to work with, we had nothing but praise for the dishes that were served. Its extensive menu covers a surprisingly wide range of Asian and Continental dishes. 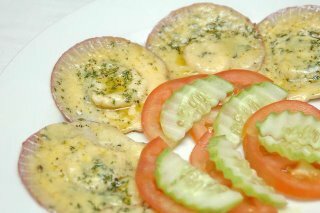 The Cheddar Butter Scallops (RM10.90 for half dozen) served in their half shells and topped with herb and cheese sauce were excellent. Oozing with enticing herbal and cheesy flavours, the succulent shellfish were an instant hit with us. Equally noteworthy were the creamy soups – a choice of Mushroom or Pumpkin or the soup du jour. On the day we went, the café won us over with its sublime Cream of Cauliflower. Despite the soup’s smooth texture, Koh assures us that very little cream is used in the preparation. “We have our own tricks of the trade to acquire the creamy texture and bring out the food’s real flavour, so it’s ok for you to indulge your tastebuds here,” she quipped. 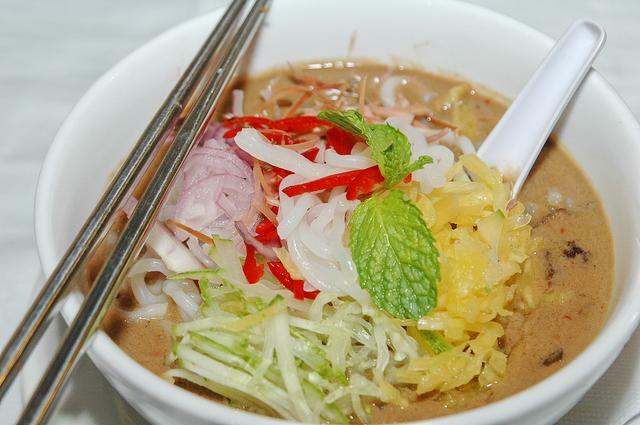 If you are partial to Assam Laksa, the wholesome version here will whet your appetite. Right now it’s quite a steal at RM6.90 – as part of Kafe Herb Spice’s Asian Delights Lunch Special. Made from flaked Norwegian mackerel which lent the tangy gravy an appetizing ‘fishy’ flavour, the laksa rice noodles come with chunky, shredded Pakistani mackerel, fine strips of cucumber and pineapple, sliced onion, torch ginger flower and red chilli, mint leaves and a side dish of hae kor (prawn paste). 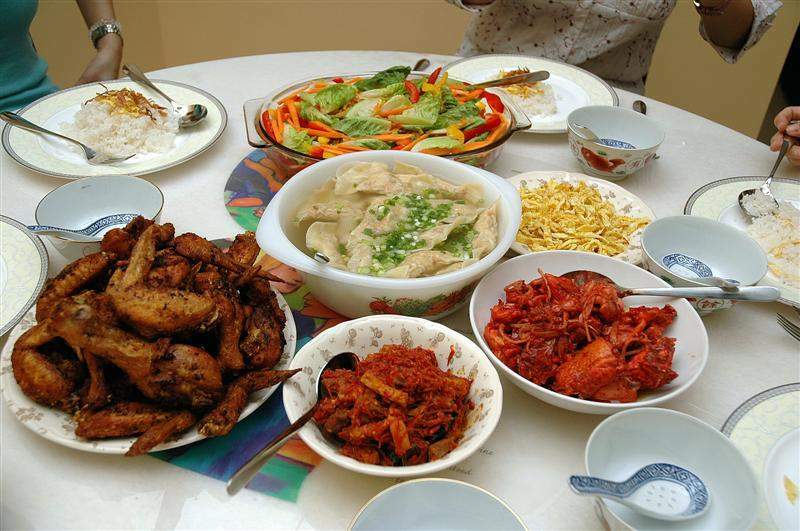 Other Asian delicacies that you may wish to sample are Nasi Lemak Chicken Rendang, Curry Laksa Marinara, Singapore Fried Meehoon and Lamb Briyani Rice. Kafe Herb Spice shows that it is possible to prepare rich, flavourful curries without coconut milk. 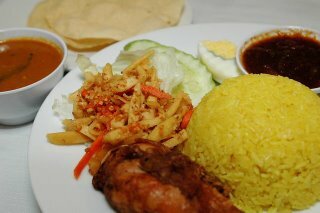 Its healthy yet immensely tasty curry is served with the Kupang Pandanus Rice (RM12.90). An Indonesian-style delicacy, the one-dish meal comprises pandan-flavoured rice with crispy fried chicken, spicy sambal, hardboiled egg, papadum crackers and mango-vegetables achar (pickles). Even the heartiest eaters will be replete after having this. Prefer something Westernised? Then the Venison Shank (RM19.90) will be right down your lane. Meltingly tender meat that is almost falling off the bone is further enhanced with a mouth-watering mixed herb sauce. Complemented by soft mashed potato and fresh salad in a light, citrusy dressing, this substantial dish is ideal for sharing. Families with children can consider the Snow White Spaghetti (RM9.90), a delightful spaghetti dish with creamy seafood sauce. Besides frozen seafood such as cod, salmon, John Dory, scallops, sea cucumber and green lip mussels, check out the shop’s selection of ready-to-cook local and Western dishes conveniently packed in takeaway, microwave-safe containers. Considering the painstaking preparation that has gone into them, the prices are reasonable. Although Koh has received lucrative offers to expand her healthy café concept into major shopping malls and as a full-fledged eatery, she prefers to concentrate at ensuring her food remains consistently up to par and high quality for now. “I am very particular about this business because it’s not easy to adhere to so many stipulations when it comes to food preparation. Quality comes at a price. My business partners will have to share and sustain the same passion, outlook and enthusiasm with no compromise to the concept. I can’t risk anyone cutting corners after a while in pursuit of quick returns. They must be in it for the long haul,” she concluded. 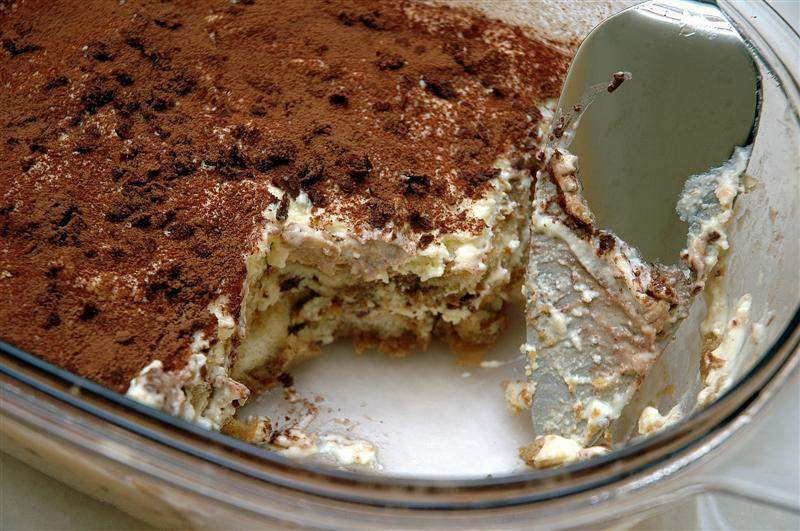 One hour is all it takes to make this tasty Tiramisu! Separate egg yolks from egg white into different bowls. Beat egg yolks while adding sugar little by little to it. Whisk until sugar has been used up and mixture turns pale cream in colour. Fold (not stir) in mascarpone cheese gently. (Tip - I used the lowest speed on my handheld mixer to blend this evenly). Fold egg white mixture gently into the earlier cheese/egg/cream mixture. Do not flatten the whites too much as this will drive the 'air' out. Pour coffee into a wide width bowl and add Bailey's Irish Cream or your choice of liqueur to it. Stir well. Line these coffee-laced sponge fingers at the bottom of a rectangular serving dish as the base of your tiramisu. Pour some of the mascarpone cheese mixture onto the sponge fingers to cover them adequately. 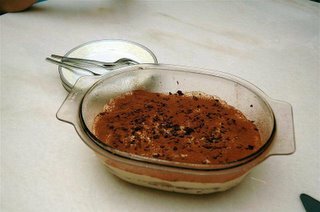 If desired, smoothen the creamy layer and sprinkle some grated dark chocolate on top. This will give the dessert an unexpected chocolatey taste. Continue layering another batch of coffee-soaked sponge fingers on top of the creamy cheese mixture. Cover this layer with the balance of the cheese mixture and garnish with more grated chocolate. Chill tiramisu in the fridge for at least an hour or more. Dust the top with cocoa powder prior to serving. Final note: if you want to reduce the sugar by half a tablespoon, I reckon it won't affect the taste too much. Also I'd prefer to use stronger coffee as the taste comes through clearer. If you don't want the bother of brewing your own coffee, buy a takeaway cup from your favourite coffee outlet! I hope you will enjoy this fabulously indulgently smooth, rich and heavenly treat!